mmsonline.com September 2017 MMS 73 FEATURE they begin to affect the process. The errors result- ing from these effects develop within the trend of par t dimensions before a tolerance is actually broken. Thus, Mr. DiNardi's recurring question to Mr. Smathers over the course of years has been, "Why couldn't we know that part was out of spec before it got to inspection?" GETTING TO SIMPLE Mr. DiNardi has a context for asking this question. Earlier in his career, before he owned a manufac- turing business, he worked for the Marshall Space Flight Center in Huntsville, Alabama. When a spacecraft is launched, this facility uses data to monitor the performance of its components. Real- time trends in the data describing a component's performance allow engineers on the ground to predict when a component is approaching failure, before that failure occurs. 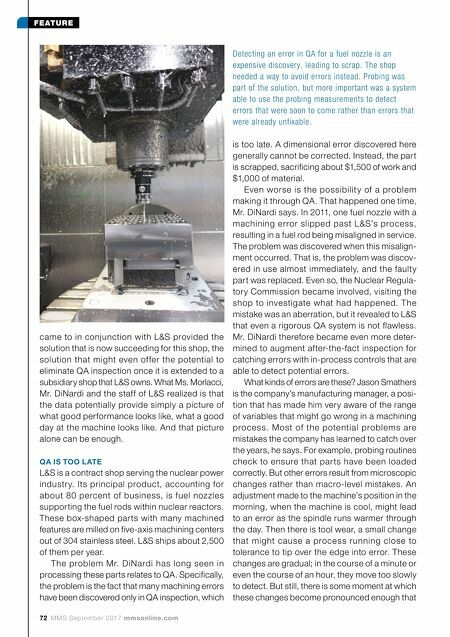 So why couldn't similar real-time analysis aid a machining process? He began searching for the way to realize this pos- sibility about eight years ago. Step one was to get the data. The Renishaw machine tool probe employed by each machining center was the means for doing this. The shop began using these probes for automatic, on- machine measurement of various critical features of each fuel nozzle part, adding about five minutes of probing to every machining cycle. But the prob- ing capabilities of the machines themselves allowed only for a momentary determination of whether a given feature was in or out of tolerance. There was no way to capture a data record over time and look for trends. At first, L&S shop personnel were manually recording data in order to develop this record. The manual recording ended when FactoryWiz machine monitoring software from Refresh Your Memor y eliminated the need, collecting data automatically so it could be analyzed later. But even with this improvement, the problem that remained was contained in that word "later." In one case, the data revealed that a certain tool needed to be changed after 16 parts. 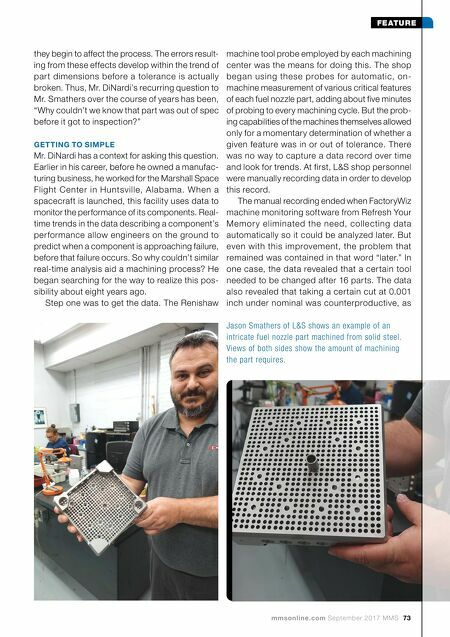 The data also revealed that taking a certain cut at 0.001 inch under nominal was counterproductive, as Jason Smathers of L&S shows an example of an intricate fuel nozzle part machined from solid steel. Views of both sides show the amount of machining the part requires.